It was inspired by a salad that I ate at a restaurant recently that contained peaches. Apart from the fact that this one contains peaches, it really bears no relationship to the other salad at all. That one had a few small pieces of fresh raw peach. For my salad I grilled the peaches in a grill pan. Read on for the recipe. It is delicious. Brush the cut peaches with some oil and put cut side down in a hot grill pan. surfaces and start to soften. Turn the peaches over skin side down, spread the chilli jam on the top and continue to cook until they start to collapse. Turn the heat off and allow to cool. 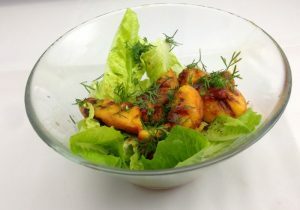 Put the lettuce leaves into a bowl, lay the peaches over the leaves. Sprinkle with chopped coriander and squeeze lime over the top.